Comparing Lebron James and Michael Jordan’s 4th MVP Award. Lebron James is now a 4-time MVP award winner receiving 120 out of 121 votes and is 1 away from tying Michael Jordan with 5. Michael Jordan won his 4th MVP award in his 11th season and Lebron James received the award in his 10th. Lebron James, 28 years old won the award 5 years younger than Jordan who was 33 when he won his 4th MVP, but let’s not forget that Lebron came into the league right out of high school. If Lebron continues his league dominance for another 5-7 years he can easlily pass Jordan in MVP awards unless somebody else receives it just because Lebron could win it every year as Jordan could have and the NBA feels someone else needs a fair shot. I think Lerbron James will finish his career winning the MVP 7 times, that’s just my prediction. Let’s take a look how their 4th MVP seasons compare. In the 95-96 season Michael Jordan not only won the MVP but led the league in scoring with 30.4 ppg to lead the Bulls to an all-time NBA best 72-10 record and is widely conisidered to be the greatest NBA team of all-time. They went on to win the NBA Championship in 6 games vs the Seattle Supersonics. Lebron James finished the 2012-2013 season 4th in the league in scoring at 26.8 and led the Heat to an NBA best 66-16 record to go along with a historic run winning 27 straight games which is 2nd all-time behind the ’71-’72 Lakers who won 33 straight. If you look at the other statistics of both seasons, Lebron averaged more rebounds (8.0) than Jordan (6.6) but Lebron has always been a better rebounder than Jordan due to his size. He also averaged 3 more assists at 7,3 compared to 4.3 for MJ. Lebron shot better from the field, connecting on a remarkable 56.5% of his shots compared to 49.5% for Jordan who was better from 3-point land hitting 42.7% from the arc to Lebron’s 40.6% They were both dominant the defensive end. MJ made the NBA All-Defenive First Team, a feat that he accomplished 9-times and Lebron finished 2nd place for Defensive Player of the Year, losing to Marc Gasol of the Memphis Grizzlies. 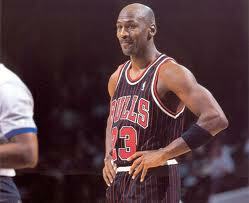 They were pretty close in steals with 2.2 and 1.9, giving Jordan the edge. They both had brilliant seasons but because this season is not over yet and the Miami Heat are on the quest to win their 2nd straight NBA title, this arguement would probably be better after the season is done if you want to look at the over all individual and team success. Some may give the nod to MJ on the team record alone and some may say Lebron had the better year by looking at his overall game. That’s up to you to decide. For those of us who did not grow up during the 1960’s or the 1980’s but heard about the Lakers-Celtics Rivalry, finally had the chance to experience it in our era. 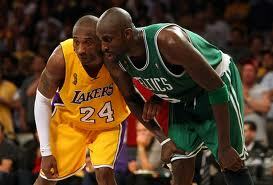 It started with the arrival of Kevin Garnett and Ray Allen to the Boston Celtics before the 2007-2008 season began. I picked the Celtics to win it all once I heard about the coming together of the “Big 3” in Boston, but others thought they would be a flop. Then the Lakers traded for Pau Gasol from the Memphis Grizzlies on Feb. 1st 2008 and quickly started to dominate out West. They were bigger, stronger and became the favorites to come out of their conference while the Celtics were taking care of business out East. 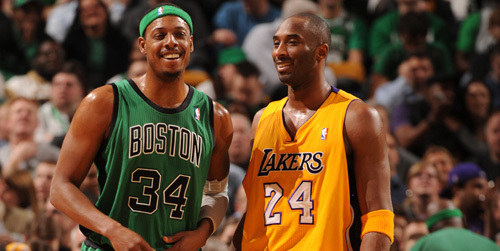 Fans nation wide start to realize that a Lakers-Celtics Finals matchup was a real possility. The Lakers defeated the San Antonio Spurs 4-1 in the 2008 Western Conference Finals and the Celtics beat the Detroit Pistons in 6 games and there we had it, a rivalry renewed. If you don’t know, I am not a Lakers fan so I rooted for the Celtics, plus I have always been a Paul Pierce and Kevin Garnett fan. The Celtics received a lot more hate from Lakers fans when Paul Pierce was carried off the court after being knocked down by teammate Kendrick Perkins with 6:49 left in the 3rd, then put into a wheelchair and came back with 5:04 in the quarter only to dominate the rest of the game in route to a 98-88 Celtics victory. The incident looked staged to a lot of L.A. Lakers fans. The Celtics went on to win the series in 6 games and Paul Pierce ended up being the Finals MVP. Laker fans wanted revenge so every meeting from that point on was an even more epic battle and ever matchup felt like an NBA Finals game. 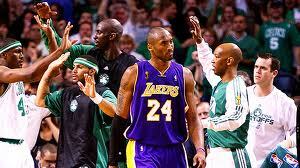 If the Lakers got a regular season win vs Boston it was a 1-up but still wanted another Finals matchup. A rematch probaby would have happened again in 2009 if Kevin Garnett didn’t get sidelined the entire Playoffs and probably could have changed the outcome of the 2nd-round 7 game series loss vs the Orlando Magic who the Lakers went on to beat 4-1 in the Finals. Kevin Garnett came back healthy and the Celtics returned to the Finals in 2010 to again face the Lakers, this was the Lakers chance to get the revenge they wanted and a chance for Boston to keep control of the renewed rivalry. The series ended in a classic Game 7 battle resulting in a 83-79 Lakers victory but the fact that they beat the Celtics made winning the Championship much more sweet. Here we are in 2013. Kevin Garnett is 36 in his 18th season, Paul Pierce is 35 in his 15 season, Ray Allen is no longer a Celtic and Kobe Bryant is 34 and recently suffered a torn achillies right before the 2012-2013 season ended. Shaq always says you cannot beat father time and it looks like father time is catching up to these great players. Sure we would love to see a great rivalry last forever as I’m sure the fans did when this rivalry was big in the 60’s and 80’s but history repeats itself and the rivalry was renewed in 2008 and is probably coming to an end. The Lakers and Celtics both finshed 7th place in their respective conferences and we will not be seeing a Finals matchup between the two this year because the Lakers have already been put out of the Playoffs. We should enjoy whatever time is left of this renewed rivalry and hope that someday it will come alive again. You know he’s on fire when he’s putting the 3 fingers to the headband like the pic above. If there was such thing as the Most Improved Superstar in the NBA, New York Knicks Carmelo Anthony would be the clear winner of this award. Carmelo has always been a great scorer and in my opinion the best scorer in the NBA for a while now but has always been criticized for not being a leader, being a one dimensional player or not being a winner. This season he turned that around becoming a better leader, better defender and was a major reason why New York won the Atlantic Division to go along with 54 wins. This season he won a scoring title for the first time in his 10-year career averaging 28.7 points per game to dethrone Oklahoma City’s Kevin Durant who won the title the previous 3 seasons. As great as a scorer Melo is, it feels like this was long overdue. He did it by improving his shooting in every category from the 2011-2012 season. His overall field goal percentage went up to .449 from .430, 3-point percentage .379 up from .335 and free throws .830 up from .804. And he did this by taking smarter shots, being more aggresive and getting to the foul line more. Although his assists numbers were down to just 2.6, he was still facilitating out on the floor. Averaging nearly 7 rebounds a game he did have a few big rebounding games in April where he grabbed 14, 12, 19 and 14. He is still not a great defender and may never be one but he has put much more focus on the defensive end this season. His major improvement as a player was noticed by the league and won NBA Player of the Month for April. That being the only month of the season Lebron James did not win. He has made a great case for runner up at MVP this season (I really don’t think there is even a debate on who gets the award this year) and has a good chance to make it to the Conference Finals and erasing some of the notion that he is not a winner. 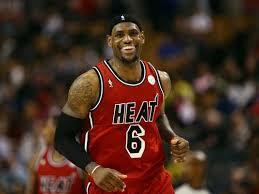 If he can get his team that far then the NBA finals is not too far out of reach even if they play the Miami Heat. It looks like Melo has finally stepped out the shadows of Dwyane Wade and Lebron James although he doesn’t have a ring, he has earned much respect and worked hard to get it. Take a look at the picture above, is it a bird? No it’s a plane….wait, it’s Super…oh Dwight Howard. Yea nothing to get excited about. I have no shame in saying I do not like the Lakers and anyone who knows me can tell you that. 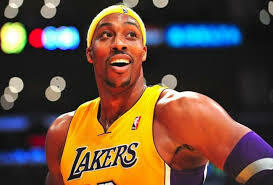 When Dwight Howard came over to the Lakers there was a lot of excitement and expectations in Lakernation. This was supposed to be the year Kobe Bryant got his 6th ring, the year the Lakers returned to league wide dominance and had the NBA in chokehold. The Lakers were supposed to rise to the top of the standings and take the Western crown from OKC and stop the Clippers from any chance at being L.A.’s best team. Pretty much the opposite of that happened. They finished with a 45-37 record which barley got them to the 7th seed, thanks to beating Houston in the final game of the season, the Clippers finshed 1st in the division winning 56 games and the Oklahoma City Thunder finshed #1 out West, and oh yea and the Lakers were swept in the 1st round by the San Antonio Spurs. As much as I dislike the Lakers, I feel a little sympathy for the fans. Now the blame is not going 100% on Dwight for their failures this season but he will get most of it. Dwight Howard decided to go to one of the most storied franchises in NBA history (probably 2nd next to the Boston Celtics) and did not improve his game. Yes he dealt with back issues but he averaged 17 points, 12.4 rebounds and finished 14th in Defensive Player of the Year voting. His postseason numbers from this season are virtually the same but averaged 27 points and 15 boards in his last Playoff appearance in 2011. And to top it off he got ejected in game 4 on Sunday, a game which he should have put up 2011 numbers. The man is 27 years old and should be at his peak. What he needs to do is obviously work on his free throws and dominate down low every time he gets the ball down low the way Shaq did. Nobody should be able to play him one on one and lock him down or put him in foul trouble. In order for “Superman” to get statue in front of the Staples Center he’s going to have to live up to his potential which he is only about 50-60% of. He has about 5-6 good years left in him before a steady decline so he better get to it. With Westbrook Out, What are the Spurs Title Chances? The Oklahoma City Thunder took a huge hit when All-Star Point Guard was sidelined the rest of the postseason to have surgery on a torn meniscus. OKC was widely considered the favorite to win the West again by many, I even chose them to rematch the Miami Heat in the Finals (I had them losing again to the Champs). 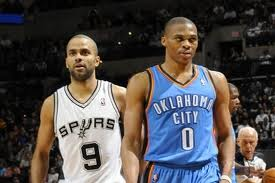 So with Westbrook out, what chance do the Spurs have at another NBA Title? The San Antonio Spurs came into this season as underdogs like always, why? I have no idea when they have won 4 NBA titles and have won 50 or more games the last 14 seasons. For most of the 2012-2013 season they were quietly 1st place out West and eventually fell to 2nd (58-24) due to some injuries and the Oklahoma City Thunder overtook the top spot in the conference. But if you know their coach Gregg Popovich being 1st place doesn’t matter because they have a proven track record of winning on the road. They wrapped up their 1st round series 4-0 sweep against the Lakers on Sunday and are getting plenty of rest while waiting on the outcome of the Golden State-Denver series, which currently stands at 3-1 in favor of the Golden State Warriors and will conclude tonight at 8ET. San Anontio has a lot to be happy about right now. Denver facing elimination, Golden State’s David Lee out for the remainder of the postseason due to a hip injury during his very first playoff game and a season-ending injury to Russell Westbrook makes the Spurs road to the NBA Finals even easier. The Spurs are still an elite defensive team, holding opponents to .442 shooting (8th) and averaged 8.6 steals a game (4th) for the regular season. While defense is primarily what made the Spurs so successful over the years they have done a great job on the offensive end as well, averaging 103.0 pts per game (4th) on 25 assists (1st) while making 39 field goals (2nd). The fact that they are very unselfish, can score points and play great defense gives them a legitimate chance to win a 5th championship but with major injuries to Golden State and OKC, it takes a little pressure off of them. I think the toughest matchup for them at this point would probably be the Miami Heat in the NBA Finals but that’s another story. I’m sure a lot of you have heard, the Knicks are ballin’ right now with a 5-0 record to prove it but how long will the success last? of course they will not go 82-0 in the regular season and then take a 16-0 ride all the way to the NBA Championship. That’s not going to happen no matter how much we would love to see an NBA team do it. Ok let’s get to what could happen and what is going on. There are now 2 teams in New York and there was a little bit of trash talking between the 2. The Brooklyn Nets are the other team who are 4-2 and have picked up some steam after the slow start but I’m gonna go with the Knicks here. I just don’t see Brooklyn as a serious contender out East, not right now. They are working all their new players together and are figuring things out defensively. The Knicks have a ton of new (old) players as well but right now they are meshing pretty well. They are leading the NBA in steals at 10.4 per game and beating opponents by an average of 15.6 points a game. (103.4 to 87.8) and holding them to just 42% shooting. Not only that they are lighting it up from beyond the arc at almost 43%. A big part in that is J.R. Smith who is 13/18 from being the stripe so far. It looks like my guy Carmelo Anthony is back to his old ways, averaging just under 27 a game and is playing the best defense of his career which he has always been criticized for. 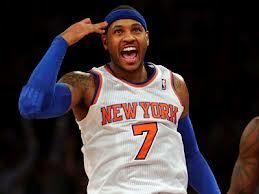 If he keeps up his current play and the Knicks are a top 2 seed come playoff time, look for Melo to be on the MVP ballot. 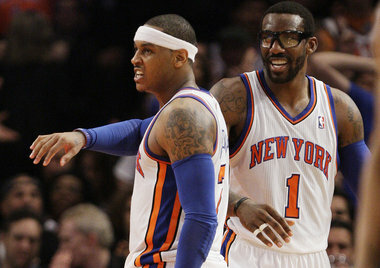 There has been a lot of question whether Carmelo and Amar’e Stoudemire can play together and we have not seen the Knicks this season with Amar’e in the lineup. He is expected to miss the first 6-8 weeks of the season as he recovers from knee surgery. How will he fit into the Knicks current system which is working quite well for them? There has been suggestions of having Amar’e come off the bench and be the leading force of the 2nd unit but how would the 6-time All-Star handle that? Or will he even accept it? These are questions that will be answered in the coming weeks as we get closer to his home. I’m sure Brooklyn will be in the playoff hunt and it may take them time before they are contenders but right now I’m gong to say the Knicks will be the top team in New York this season and could challenge the Miami Heat and Boston Celtics for the Eastern Conference crown. Subscribe to get NBA stories to your email as they are posted.